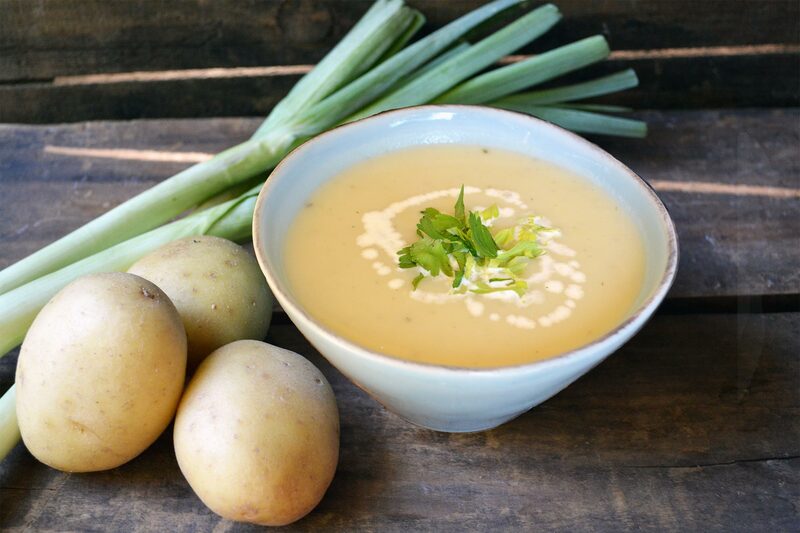 Potato leek soup is one of the classics - and is very easy to make! This creamy, hearty soup makes for a delicious and satisfying meal in a very short amount of time. Split the leeks lengthwise and wash well. Chop the white and pale green parts. (Reserve the green parts for our root-to-stalk vegetable broth). In a large saucepan, saute the leeks, celery and garlic with the butter for 8 to 10 minutes, until softened but not browned. Season with salt and pepper. Add the potatoes, broth, bay leaves and thyme. Bring to a boil, cover and reduce heat to low. Simmer for 20 minutes. Remove from heat. Using an immersion blender or working with a blender in batches, puree the soup until smooth. If using a blender, return the soup to the pan. Stir in the milk and cream. Season with salt and pepper to taste. Garnish with chopped celery leaves and a swirl of cream. Enjoy!